As I drove and hiked and poked my way through eastern Death Valley, I kept seeing this shrub. It seemed like it was everywhere. Later research confirmed my informal observations: 70% of the Mojave desert is covered in well-spaced stands of it, and indeed the plant community is named for it: creosote bush scrub, which occurs in elevations below 3,500′ in areas with very hot summers, winters that don’t quite get to freezing, and extremely low average annual rainfall amounts (0-2″ in dry years, up to 8″ in wet years). Larrea tridentata (Zygophyllaceae) is evergreen, can grow up to ten feet tall (usually it’s much shorter), is considered weedy by some authorities, and ranges from California southeast to Texas. The more I read, the fascinated I became. Here are a few random facts. Common names include creosote bush, governadora, greaswood, guamis, hediondilla, and confusingly, chaparral (confusing because it is not a part of the chaparral plant community). 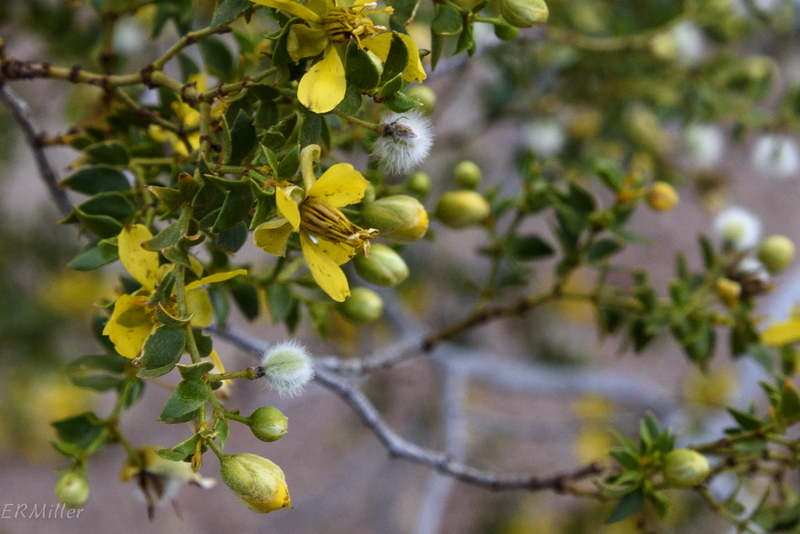 Creosote bush was used by native peoples as a medicinal for treating respiratory conditions, various inflammations, viral and fungal infections, arthritis, and many other things. It has analgesic, antidiarrheal, diuretic, and emetic properties. 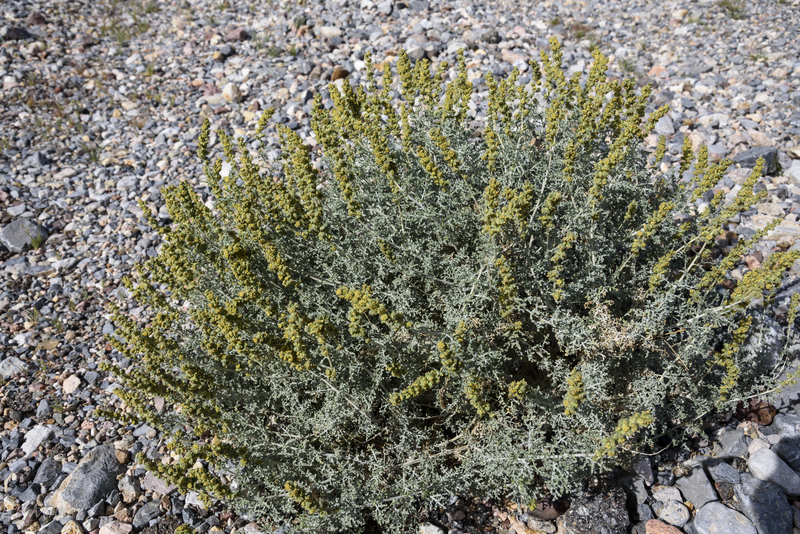 The plant is allelopathic, meaning it engages in chemical warfare, by releasing chemicals through its roots to inhibit the growth of other plants, including, possibly, other creosote bushes. Most young creosote bush plants are established under a canopy of burrow bush. In addition to sexual reproduction, creosote bush reproduces vegetatively. The resulting clonal colonies can live thousands of years, making them among Earth’s longest-living organisms. One colony has been estimated to be 9,400 years old. 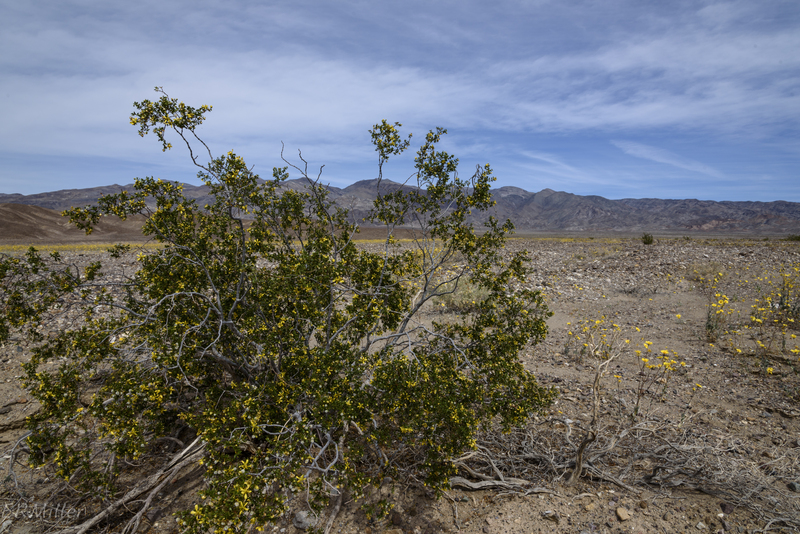 Another species is co-dominant with creosote bush in its community; that one is known by the common names white bursage, burro bush, and burro weed. I didn’t see as many of these plants, but as soon as I saw one up close, I had an unpleasant suspicion that it was closely related to a much-hated plant back home. I was right. 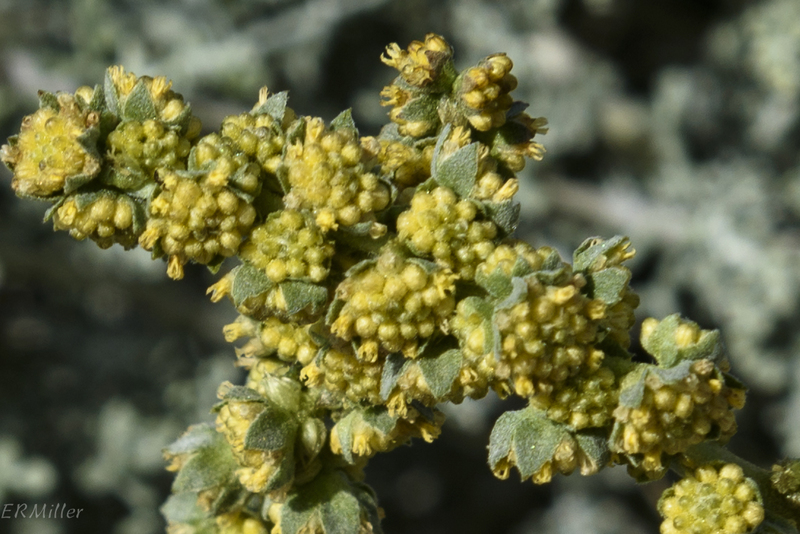 Burrow bush is Ambrosia dumosa (Asteraceae), in the same genus as giant ragweed (A. trifida). And just like giant ragweed, it produces a very fine pollen that’s dispersed by the wind, making it a potent allergen. Burrow bush grows in the Mojave and Sonora deserts. It grows to about three feet tall, and is drought-deciduous (meaning it drops leaves in extremely dry conditions). This entry was posted in Uncategorized and tagged Ambrosia, Asteraceae, burrow bush, creosote bush, creosote bush scrub, Death Valley, Larrea, Zygophyllaceae by elizabeth. Bookmark the permalink.